We caught an early bus to Marrakech (also called Marrakesh or Murrākush) and left Ouarzazate behind. This time we took a CTM bus. We always tried to do that but on some occasions CTM was not an option. The bus was quite new and really decent even by European standards. Nevertheless we were the only foreigners on board. 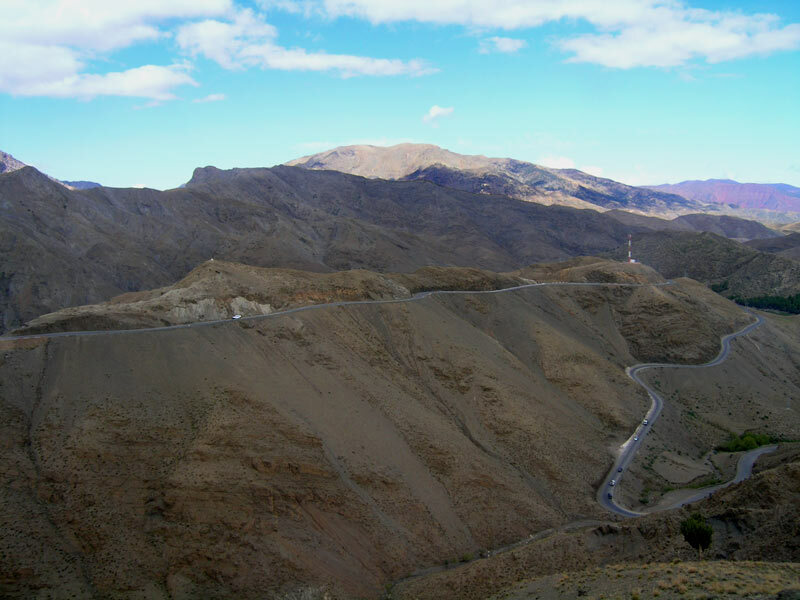 Considering the narrow, winding road over the high Atlas mountains and our experience so far, the bus driver was driving very carefully, slowing before every tight turn. Nevertheless some of the local passengers were not taking it too well, throwing up every fifteen minutes. At first it was quite awful but eventually we got used to it. Five and a half hours, several puking bags (fortunately not by us) and a few stops later, we arrived to Marrakech. The first stop was next to an improvised fruit stand. Actually to be accurate, it was an apple stand. A guy, obviously the bus driver's acquaintance, was standing next to the road and had ten boxes of apples to sell. Passengers seemed quite thrilled - almost everybody got at least a few apples. 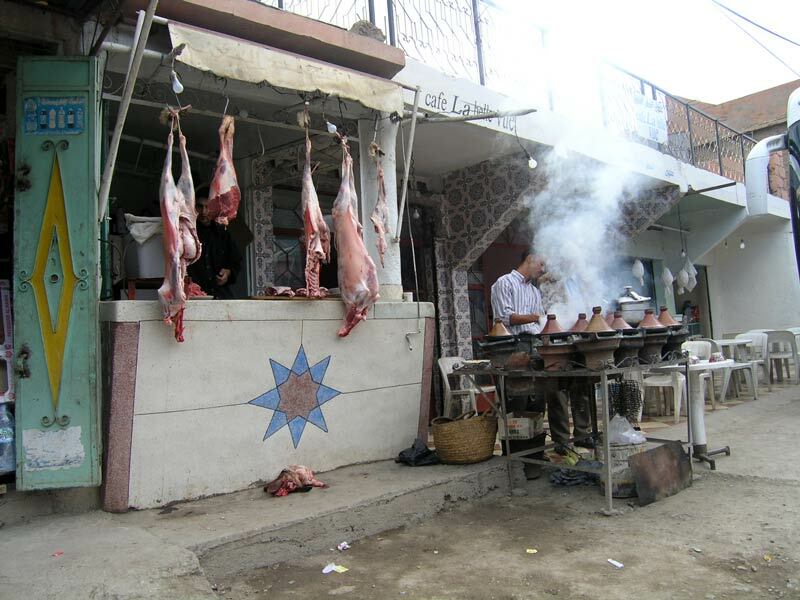 Next stop was in a small village which consisted of a few houses and an all-in-one café, butcher's shop and grill. A cow curiously looked at us through a door of one of the houses. It was quite interesting to watch most of the passengers gorging on whatever was on offer, just to puke it all out a few minutes later. At the Marrakech CTM bus station we caught a petit taxi which took us to the old town center. He dropped us near the main square - the famous Djemaa el Fna. We were looking for a specific hotel that was recommended to us back home and we soon found it. Despite a very friendly receptionist, we couldn't get a room. It appeared to be full, so we decided to try our luck again on the next morning. Finding another hotel was not so hard, but we still had to check out a few of them to find at least a half decent substitute. Since it was just for a single night we settled for the Hotel El Kennaria, which turned out not to be the best of choices (besides relatively clean sheets, everything else was bellow our not at all high standards). We quickly got over the check-in formalities and left to explore the city. First we walked around the Djemaa el Fna for some time and then plunged right into the maze of narrow streets behind the square. We were a bit disappointed - from all the stories we had heard we expected the city Medina to be something really special. Instead it just looked kind of fake and touristy - it just couldn't compare to the one we saw in Fes. 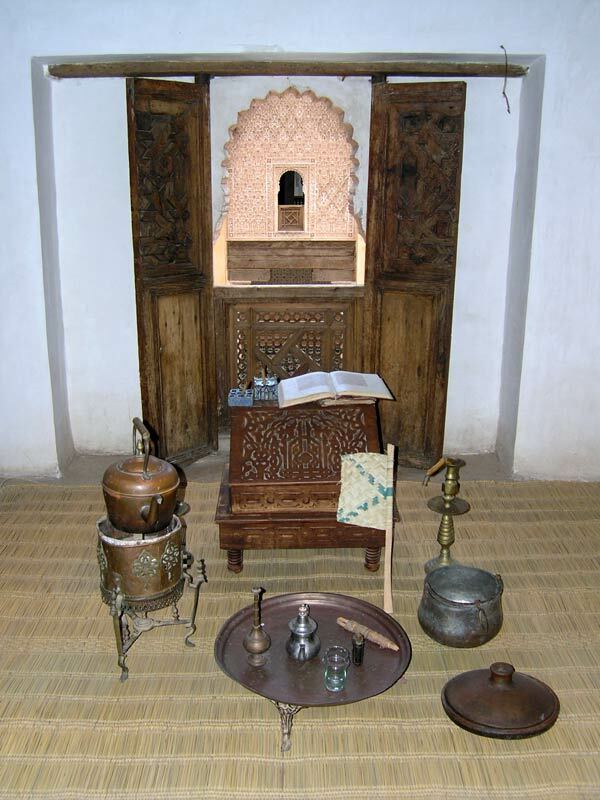 Soon we found the Museum of Marrakech and went in. It wasn't all that special, but still worth a visit. The atmosphere was really relaxed and some of the wall carvings and tile works were quite stunning. When we were done with the museum, we also took a look at the nearby buildings. It didn't take us long to find Medersa Ben Youssef. 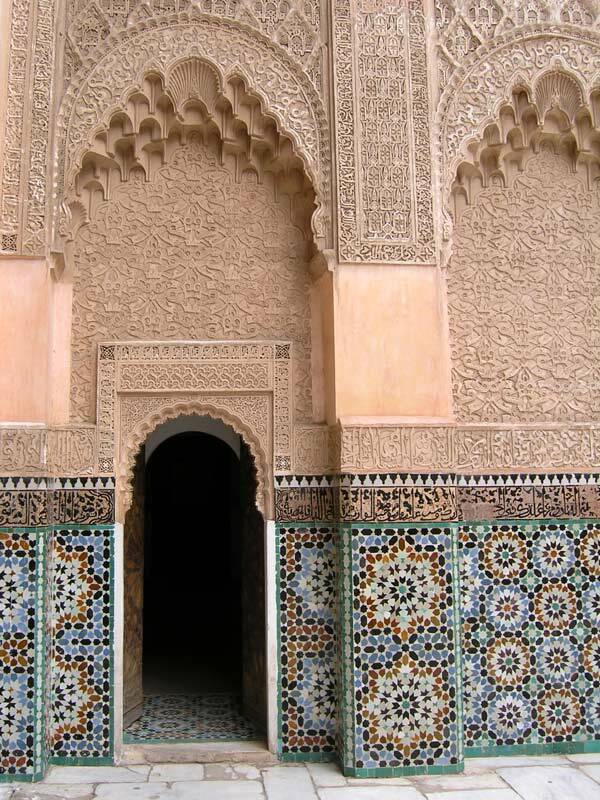 Medersa or Madrasa is a word for school in the Arabic world. This one in particular was an Islamic college and is today open to public. It offers magnificent examples of calligraphy, carved in stone and wood all over the place. Two of the small student cells had been decorated in a supposedly authentic way. One represents a poor students cell and the other one of an aristocrat. By today's standards both of them are quite modestly furnished. The atmosphere was nice, peaceful and really reminded me of a monastery in the Christian world. We ended our day with another stroll around Djemaa el Fna. By this time it was transformed into one large barbecue. More then hundred stalls was offering freshly cooked, fried and grilled dishes. Thick clouds of steam were rising high into the air. A strong mix of smells was impossible to ignore. We tried our luck at one of the stalls and ordered some squids, shrimps and lamb kofta (local version of meat balls). We rounded it all up with a cup of mint tea at a fancy café, overlooking the square. This is a wonderful post and brings back so many memories for me.I was born in Algeciras,Spain and have been to Fez and Tangers many times.I found Morocco to be a very beautiful country.Your post just reminds me how much I need to start traveling again.Thanks. Marrakech is a city full of treasures. Morocco is a very beautiful country. Will surely like to visit through the beautiful and original photo you put over there. 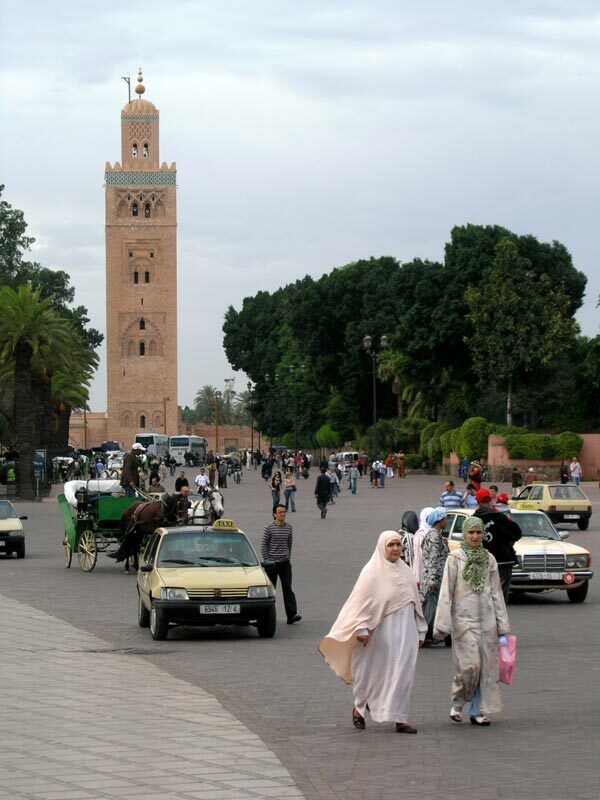 What is so special about Marrakech?